Clare Daly TD says Nóirín O’Sullivan’s position is “untenable”. GARDA COMMISSIONER NOIRÍN O’Sullivan has dismissed claims that she had anything to do with any ‘targeting’ of whistleblowers making protected disclosures. 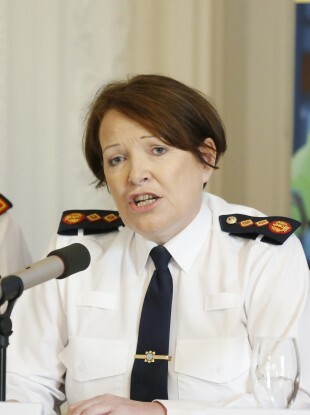 “Commissioner O’Sullivan would like to make it clear that she was not privy to nor approved of any action designed to target any Garda employee who may have made a protected disclosure and would condemn any such action,” gardaí said in a statement. It would be inappropriate for An Garda Síochána to comment on the specifics of any protected disclosure. Earlier, Independents4Change TD Clare Daly said it is “beyond time for the Garda Commissioner to go”. Speaking in the Dáil today about the latest whistleblower allegations, she said there is a “huge gulf” between the public statements of Garda Commissioner Nóirín O’Sullivan on the protection of whistleblowers and the reality on the ground. It is alleged that Garda management orchestrated a campaign to undermine the character of the whistleblower. The Commissioner wishes to reiterate that any employees in An Garda Síochána who bring forward any concerns or issues they might have will be taken seriously and the matters examined. The statement adds that, contrary to reports, all contact with whistleblowers in the gardaí must first pass through the executive director of human resources and people development within the force. This executive director “at no stage” reported to the Minister for Justice, the statement says. The preparation of reports for the Minister for Justice under section 41 of the Garda Síochána Act is a matter for the Garda Commissioner only. Earlier in the Dáil, Daly asked the Taoiseach how many examples the Taoiseach needed before he would take action. She told the chamber the Minister for Justice and Equality France Fitzgerald has had evidence from the O’Higgins Commission of Investigation and a Section 41 complaint from the civilian head of the gardaí. … Most shockingly, she has had the protected disclosures of two senior gardaí outlining systematic, organised, orchestrated campaigns not just to discredit a whistleblower but to annihilate him, with the full involvement of the current and former Garda Commissioners. What in God’s name does the Taoiseach need another investigation for? Is it not patently obvious that it is beyond time for the Commissioner to go. The Garda Commissioner has come under increased pressure this week following the allegations, which were submitted to the minister under the Protected Disclosure Act. Speaking in the Dáil today, Taoiseach Enda Kenny said a judge could be asked to examine the allegations. The Taoiseach said Frances Fitzgerald would probably not be able to discover for herself if the claims were true. He said she is currently assessing the documents and she will appoint a person of competence to deal with it. “That may well be the appointment of a sitting judge,” he said. Daly, however, does not accept this statement and says that O’Sullivan’s position is “untenable”. “I know for a fact that people who have come forward on the watch of Commissioner O’Sullivan with protected disclosures have had no contact at all from her in relation to their claims,” she said. Daly claimed that another whistleblower had written to the Minister for Justice four times complaining about how he was being treated for being a whistleblower. She said the position of the Commissioner now had to be called into question. “Does the Taoiseach have confidence in the Minister and the Garda Commissioner?” asked Daly. “I have already stated I have absolute confidence in the Minister for Justice and Equality and the Garda Commissioner. I do not have any reason not to,” replied Kenny. The issue was also raised by Daly’s fellow Independents 4 Change TD Mick Wallace in the Oireachtas Justice Committee this morning, who insisted the fresh claims showed it had been a mistake to appoint O’Sullivan to the top job in the gardaí. The Wexford TD told Minister Fitzgerald that the top hierarchy of An Garda Síochána was “dysfunctional” and said that fact may have been brought home to her by the document pertaining to protected disclosures that “landed on her desk” on Monday morning. “I’m sure you agree it’s pretty frightening,” Wallace said. I think you have enough evidence now that it was a mistake to give Nóirín O’Sullivan Callinan’s job [as Garda Commissioner]. We’re paying a price for it and the longer the problem is not addressed I think the worse it will get. Responding to Wallace’s comments, the Justice Minister said she was committed to the five year reform plan for An Garda Síochána, which is focused on modernisation and renewal of the force. In relation to the protected disclosures, she said she was limited in what she could say as she was bound by the provisions of the Protected Disclosures Act 2014. She had to protect the identity of anyone who made a submission via the Act, Fitzgerald said. Whatever is out there in the public arena is out there – but I have a duty as Minister for Justice, and under the Protected Disclosures Act, it’s very clear [about] the legal obligations that I have, it’s very clear about the legal obligations of the person to whom a protected disclosure is made. She said she was in a position to confirm to the committee that she had received correspondence earlier this week, under the Act, from members of the gardaí. “I cannot for obvious reasons go into the detail. But I can assure the committee that I am very carefully, very carefully assessing and considering what is the appropriate response to those disclosures and how they can best be dealt with,” she said. She would consider in great detail how to respond, Fitzgerald added, and would do so in a way that ”protects whistleblowers and is fair and is seen to deliver justice to all”. TheJournal.ie has asked An Garda Síochána for a response to Clare Daly’s comments this morning. Email “Garda Commissioner 'did not know of, nor approve, any targeting of anyone making protected disclosures'”. Feedback on “Garda Commissioner 'did not know of, nor approve, any targeting of anyone making protected disclosures'”.